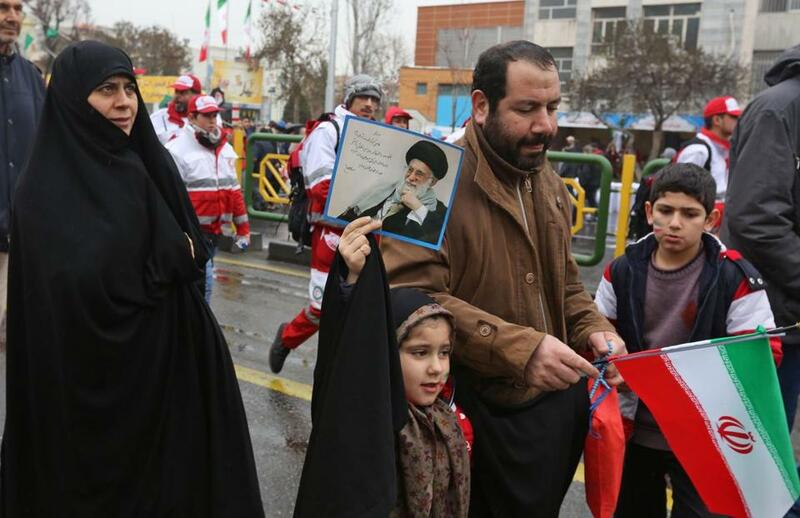 An Iranian girl held up a portrait of the country&apos;s Supreme Leader Ali Khamenei as she marched in Tehran on Monday. TEHRAN, Iran — Hundreds of thousands of people poured out onto the streets of Tehran and other cities and towns across Iran on Monday, marking the date 40 years ago that is considered victory day in the country’s 1979 Islamic Revolution. In Tehran, crowds streamed in the rain from a dozen of the capital’s far-flung neighborhoods to mass in central Tehran Azadi, or Freedom Square, waving Iranian flags and chanting ‘‘Death to America’’ — a chant that has been standard fare at anti-U.S. rallies across Iran. Downtown Enghelab, or Revolution Street, was decorated with huge balloons and loudspeakers blared out revolutionary and nationalist songs to encourage people to join the rallies. Iranian state TV ran archive footage of the days of the uprising and played revolutionary songs. The festivities start every year on Feb. 1 — the day Khomeini returned home from France after 14 years in exile to become the supreme leader as Shiite clerics took power — and continue for 10 days, climaxing on Feb. 11. This year’s anniversary comes as tensions rise with the United States and Iran is grappling with the aftermath of President Donald Trump’s pullout last May from the 2015 nuclear deal between Iran and world powers and also tough U.S. economic sanctions, re-imposed in November. Speaking from a podium in central Tehran, Iranian President Hassan Rouhani addressed the crowds for nearly 45 minutes, lashing out at Iran’s enemies — America and Israel — and claiming that their efforts to ‘‘bring down’’ Iranians through sanctions will not succeed. Along with the chants ‘‘Death to America,’’ Monday’s marches were also a backdrop to the military’s display of Iranian-made missiles, which authorities showcase every year during the anniversary celebrations. Iran has missile capability of up to 2,000 kilometers (1,250 miles) — far enough to reach Israel and U.S. military bases in the region. Over the past decade, Iran has frequently test-fired and displayed its Iranian-made missiles, sent several short-lived satellites into orbit and in 2013 launched a monkey into space. The U.S. alleges Iran’s launches defy a U.N. Security Council resolution calling on Iran to undertake no activity related to ballistic missiles capable of delivering nuclear weapons. Tehran denies the charge, insisting its satellite launches and rocket tests do not have a military component. ‘‘We do not and we will not ask permission for producing any type of missiles from anybody,’’ Rouhani said in his speech, though he stressed that Iran would ‘‘continue constructive engagement’’ with the international community. ‘‘I see a bright future for him and our nation,’’ Hosseinpour said. Mahmoud Hemmati, 35, was pushing his 68-year-old mother, Parivash Fakheri, in a wheelchair, to the rally. ‘‘My mother, despite her illness, asked me to bring her out,’’ he said. Last week, Supreme Leader Ayatollah Ali Khamenei defended the ‘‘Death to America’’ chants but said they are aimed at America’s leaders such as Trump and not its people. Iranian state TV anchor Mehdi Khosravi chirped how he expects John Bolton, U.S. national security adviser, to be very angry on Monday since he had once predicted Iranians will not see the 40th anniversary of their revbolution.